An important theme in Medieval art is the continuity of the Roman Empire. 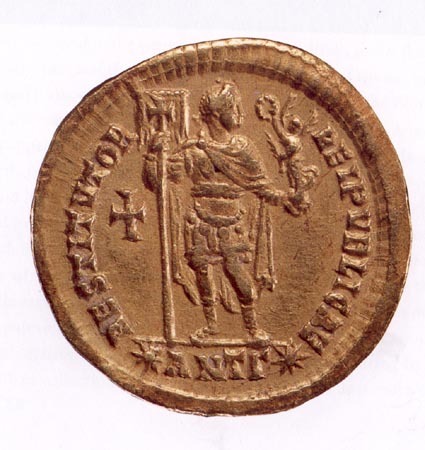 As we will see the Byzantine Empire of Justinian and the Carolingian Empire of Charlemagne traced their origins back to the Roman Empire of Augustus and his followers. But just as continuity is an important theme, so is transformation. The institution of imperial authority underwent dramatic changes during the period of Late Antiquity. The idea of the Emperor as the Principate or the first citizen of Rome gave way to the idea of the Emperor as the Dominate or as the absolute and awesome wielder of power. This transformation in the conception of imperial power is dramatically manifested in imperial images. As testified to by the quotation above, images of the Emperor held great power in the Roman World. Ernst Kitzinger has written that art became Medieval before it became Christian. By this he means that there was already a move away from the naturalistic and organic style of the Classical tradition to a more abstract and mechanical style independent of the influence of Christianity. Jás Elsner in his recent book Imperial Rome and Christian Triumph, has written: "Power is very rarely limited to the pure exercise of brute force.... [T]he Roman state bolstered its authority and legitimacy with the trappings of ceremonial --cloaking the actualities of power beneath a display of wealth, the sanction of tradition, and the spectacle of insuperable resources....Power is a far more complex and mysterious quality than any apparently simple manifestation of it would appear. It is as much a matter of impression, of theatre, of persuading those over whom authority is wielded to collude in their subjugation. Insofar as power is a matter of presentation, its cultural currency in antiquity (and still today) was the creation, manipulation, and display of images. In the propagation of the imperial office, at any rate, art was power. 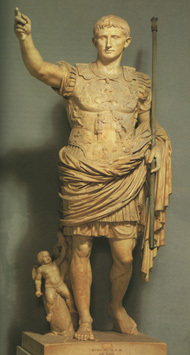 Augustus of Primaporta, c. 20 B.C. 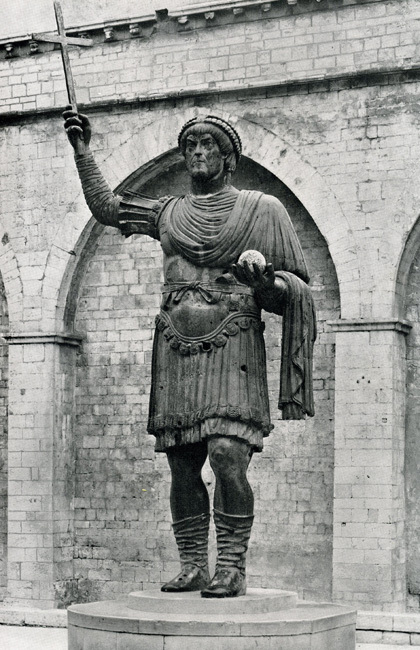 or 14 A.D.
Colossus of Barletta, early 5th century A.D.? While clearly an imperial image with the diadem or crown, we are not certain about the identity of the Emperor. 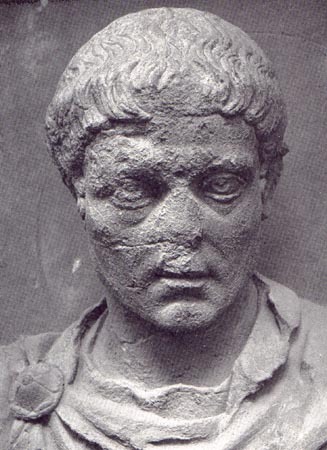 Guesses have ranged from Valentinian I (emperor 364-375) to Marcian (emperor 450-7). Both of these statues can be identified as cuirass statues, referring to the military breastplate worn by the figures. This formula documents the military function of the Emperor as the leader of the army. The upraised arms of both figures can be related to the so-called ad locutio gesture that traditionally conveyed the power of speech in Roman art. Both of these images were intended to give visual demonstration of the emperor's power. Scholars have noted that the change in styles evident in this comparison can be associated in a significant reformulation of the theory of imperial power that occurred in the period between these two works. 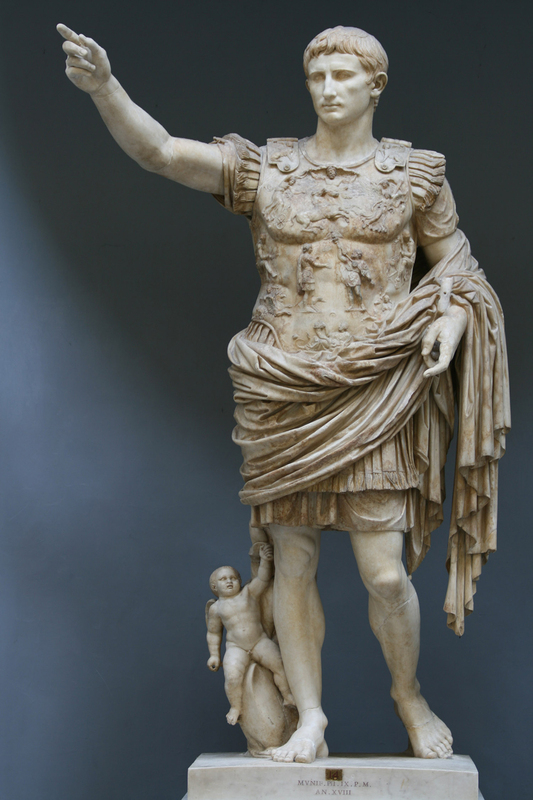 Augustus saw himself as the Principate of Rome. By this he meant that he considered himself the first citizen of Rome or the first among equals. 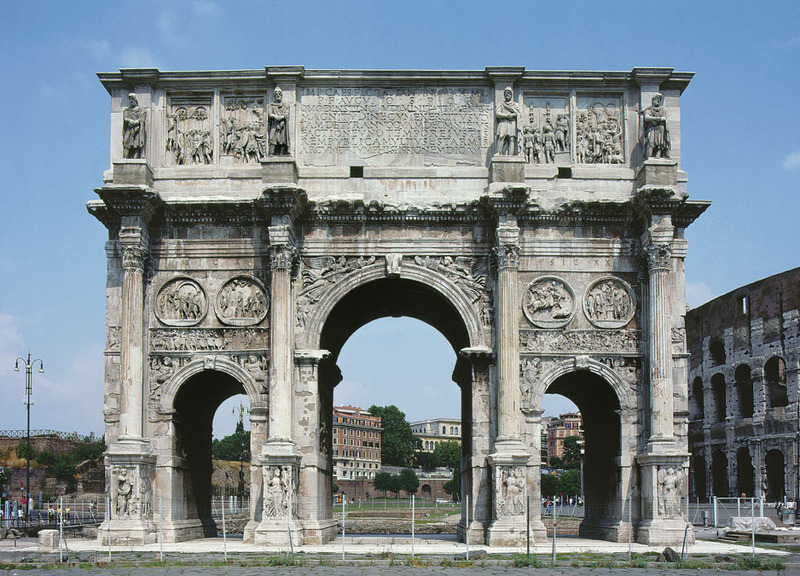 By the end of the third century A.D. the Emperor was considered to be the Dominate. This asserts the absolute and divine authority of the Emperor. This shift in conception of the Imperial nature is reflected in laudatory descriptions of the Emperor or what are are called panegyrics. Read the texts included on the page entitled Imperial Panegyrics and relate them to the comparison above. In your journal entry discuss how these two images make you feel and your sense of relationship to them. 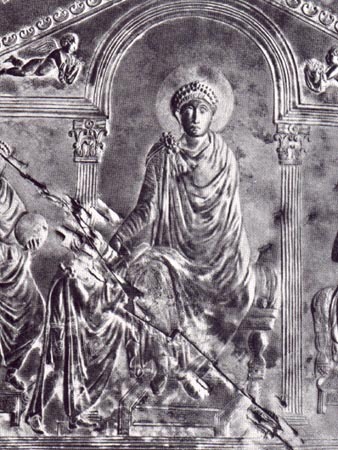 This connection between Constantine and Rome's past glory is also found in the Constantinian reliefs. 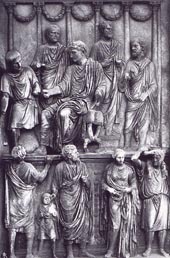 For example, one of the principal Constantinian reliefs shows Constantine making an oration as part of the triumphal celebration after his defeat of Maxentius. 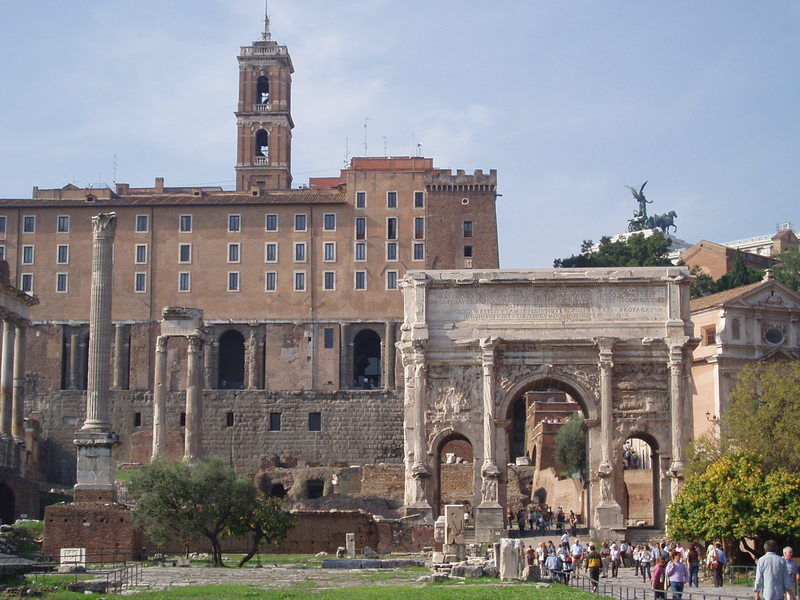 The oration is set at the Rostra in the Roman Forum, the central public meeting place in Rome. 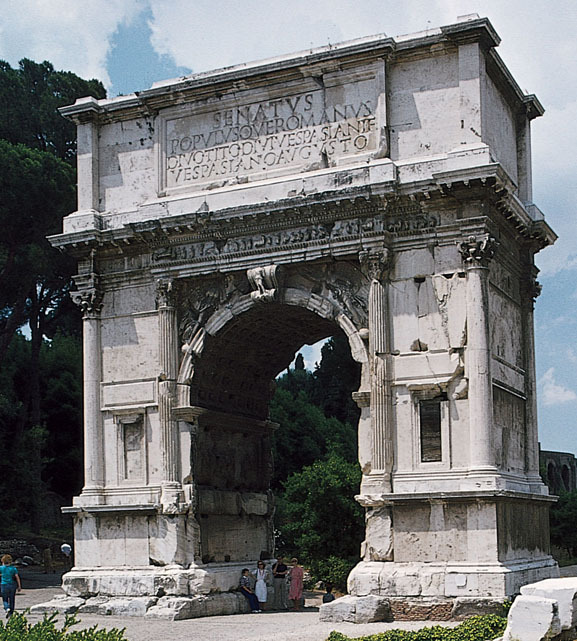 The arches on the right undoubtedly refer to the Arch of Septimius Severus while the structure on the left probably represents the Basilica Julia, begun by Julius Caesar in 46 Bce and completed by Augustus. The now beheaded figure of Constantine is shown in the center of the relief making the ad locutio gesture and wearing military dress. The origin of the office of imperator was as military commander. Constantine's dress and gesture thus define him as the voice of imperial authority. He is surrounded by frontal figures dressed in togas, the traditional dress associated with members of the senatorial class. 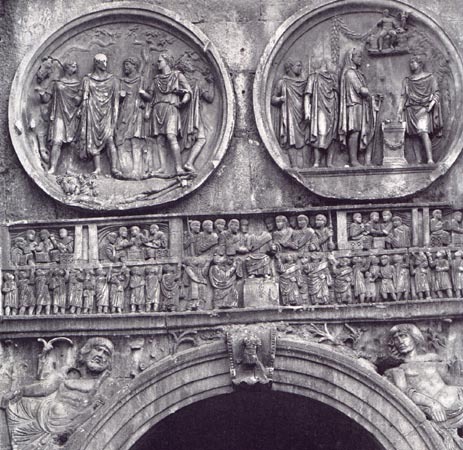 At either end of the Rostra appear two seated figures elevated above the other figures. These seated figures are identifiable as sculptural portraits of Hadrian and Marcus Aurelius. 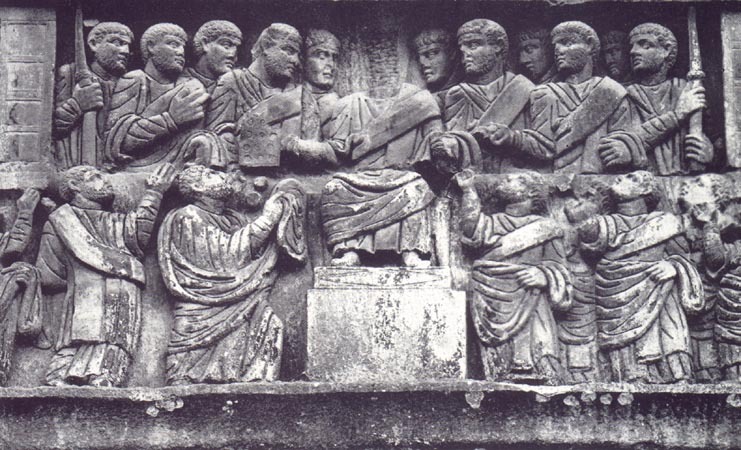 The three highest figures in the relief are, thus, Constantine (had his head survived) and the two second century predecessors. 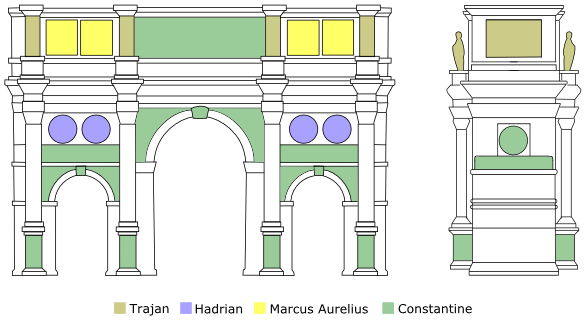 The five columns behind the Rostra make a reference to the link between Constantine and his immediate predecessor Diocletian. 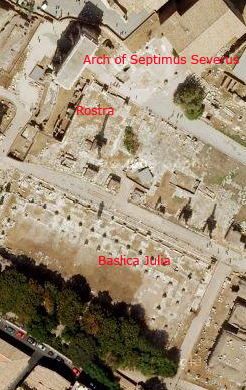 In 303 A.D. a monument commemorating the tenth year of Diocletian's rule was constructed at the Rostra. 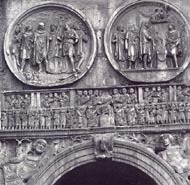 The monument was composed of five columns with the central one topped by an image of Jupiter, flanked by others topped by images of the four Tetrarchs. 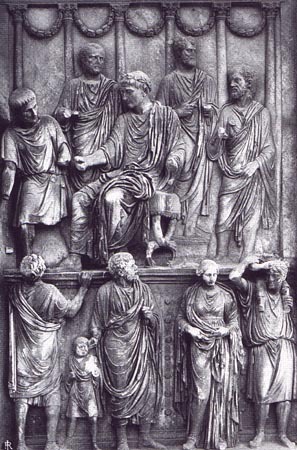 This relief thus places Constantine at the center of Rome both physically, socially, and historically. 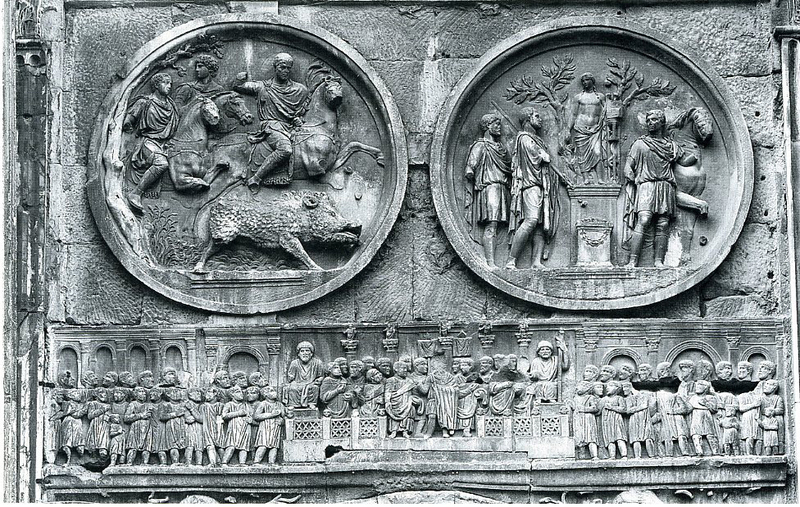 In your journal, compare the styles of these two reliefs. 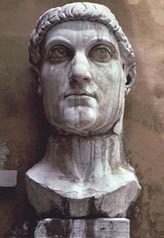 The carving of this head demonstrates the point that there were still sculptors available at the time of Constantine who were capable of working in the Classical style. 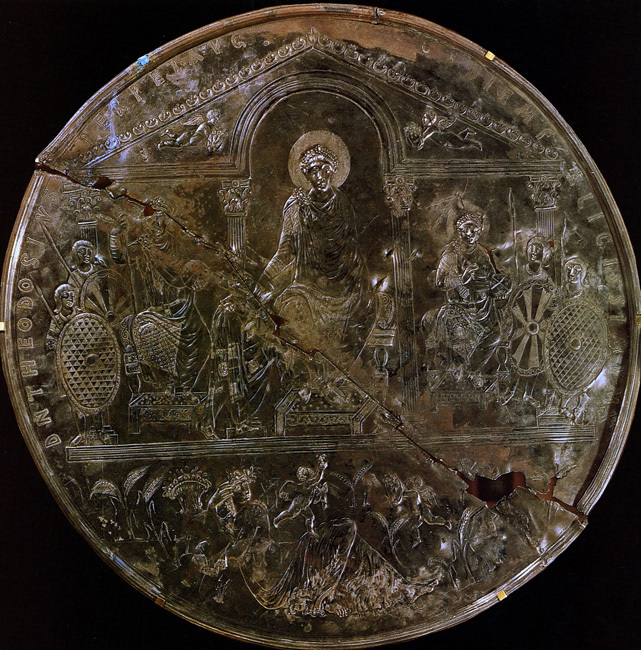 Consular Diptych of Probus depicting the Emperor Honorius, 406 AD. Holds Labarum with inscription: In nomine XPI vincas semper (In the name of Christ you always conquer). Note halo around head of Honorius with inscription: Dn Honorios semp aug (Lord Honorius always Augustus). 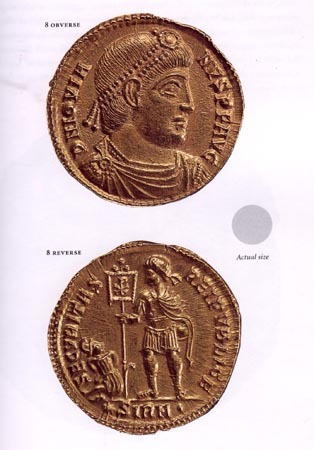 Coin of the Emperor Jovian holding the Labarum with the monogram of Christ, 363-4 A.D.
What do you make of the comparison of these different images? Compare these heads to that of the Colossus of Barletta. Write your responses in your journal. A significant innovation / renovation in the portraiture of Constantine is the decision to represent himself beardless. 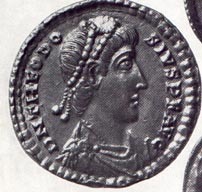 From the second century emperors like Hadrian, it had been a regular convention to represent the emperor with a beard. This was apparently to relate the Emperor to conventions of representations of Greek Philosophers. 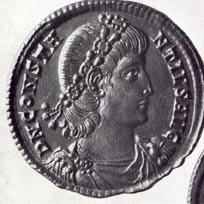 The beardless type consciously adopted by Constantine links him back to the beardless formula adopted by Augustus and his successors (see the Augustus of Primaporta above). 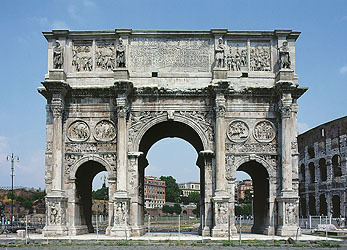 It thus signifies a break from the immediate past and a link to the foundation of Imperial rule with Augustus. The adoption of this formula by his successors was a way of establishing a dynastic link to Constantine as the new Augustus. 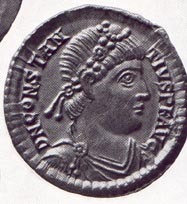 It is significant that Julian the Apostate (reigned 361-3) who was the only pagan fourth century emperor revived the bearded type. 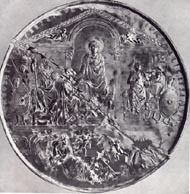 This silver plate was produced to commemorate in January 388 the decennalia or tenth anniversary of Theodosius's accession to the Imperial Office. In your journal present your "reading" of the symbolism of this work.